Our range of products include vsp hi flow ring. 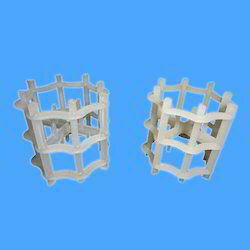 We are highly instrumental in the process of fabrication of a wide range of VSP Hi Flow Ring. This coveted product is a comprehensive plastic product used in various applications of heavy duty industries such as petroleum and chemical processing. With complete precision we have designed this range to meet severe environmental conditions. Basically this plastic product has continuous exposure to heat and water in cooling towers.